SMS INC. 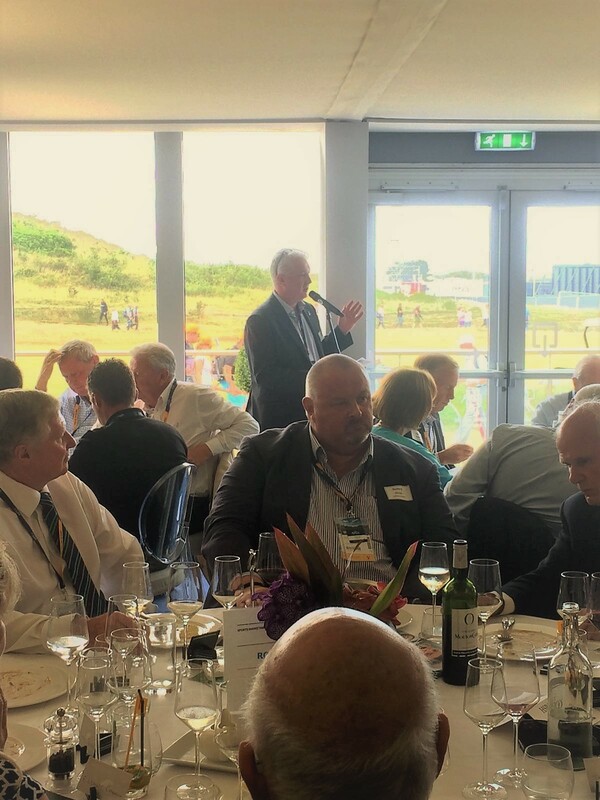 HOST 33RD ANNUAL GOLF INDUSTRY LUNCH | Sports Marketing Surveys Inc.
As well as undertaking multiple research projects at The Open this year, SMS INC. was busy co-hosting the 33rd annual Golf Industry Lunch at Royal Birkdale. 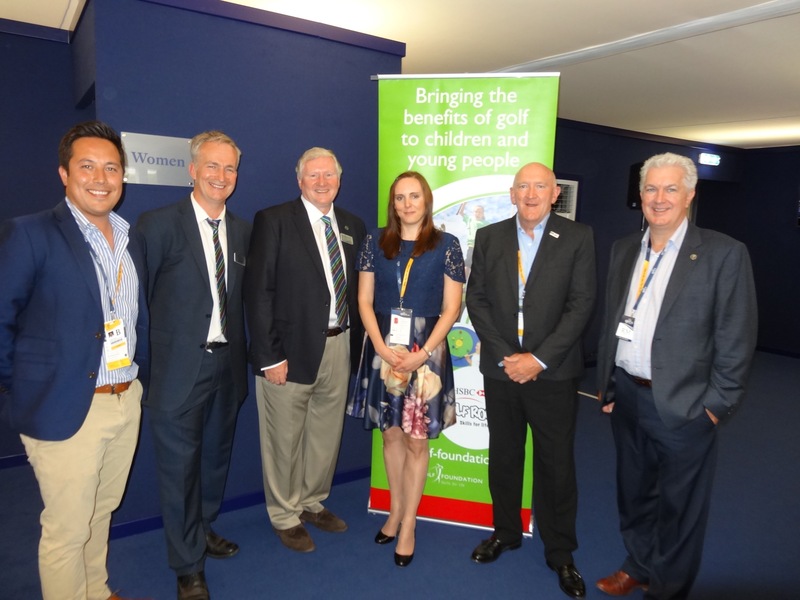 For a ninth year, SMS INC. partnered up with the British Golf Industry Association (BGIA) and the Golf Foundation to host the Golf Industry Lunch, which supports the Golf Foundation’s initiative HSBC GolfRoots. 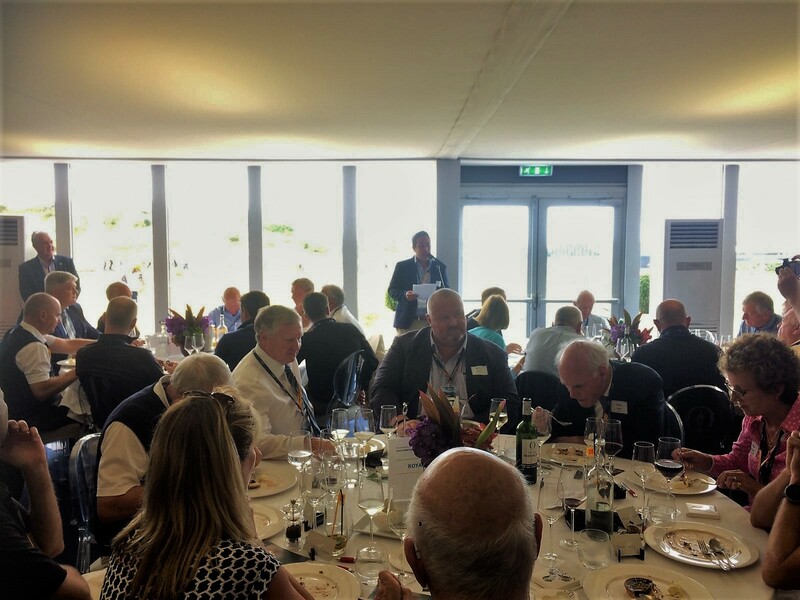 The Lunch is a major event in the golf industry’s calendar, and is attended by key figures from all corners of the game . The lunch was attended by 145 of the industry’s most influential people. The Lunch takes place annually and is an opportunity for experts to discuss the state of the golf industry, considering where new perspectives and expansions will be able to grow the game. A wide range of industry representatives attend and this year SMS INC’s John Bushell and Richard Payne, The BGIA’s Philip Morley and Brendan Pyle of the Golf Foundation each gave a speech. Good afternoon Ladies and gentlemen, in a change to the scheduled programme, the honour of welcoming you all to the Open Industry Lunch on behalf of SPORTS MARKETING SURVEYS INC. has fallen to me this year. Now please don’t panic, as John will be up to regale you with as many sporting facts as humanly possible shortly, but he now believes that his speech is in such demand that he insisted on a warm-up act! SO, welcome to Royal Birkdale for the 146th Open Championship, the 10th to be hosted here on this beautiful Southport Links and incidentally also my 10th Open working for SMS – with the 2008 Open won here by Padraig Harrington being the first Championship and first Open lunch that I attended. This is the eighth lunch hosted by SPORTS MARKETING SURVEYS INC. and the BGIA on behalf of HSBC Golf Roots; and in my first speech it gives me great pleasure to continue the tradition of once again welcoming Paul Jepson and Ian Peacock who are both attending their 32nd Sports Marketing Surveys Open lunch. This is a tradition and a ‘run’ that we are delighted continues. A lot has happened over the past 12 months since we were all together at Troon – from golf making its comeback at the Olympic Games; to Sergio finally making his major breakthrough at the Masters; to Rafa Nadal winning his 10th Roland Garros French Open; and John Bushell almost completing his first half marathon in Brighton! Unfortunately for John, the race organisers re-measured the route after the race and found out the course was an 8 iron short of the required distance! There have also been several developments and exciting projects conducted at SMS INC. ranging from global studies being conducted for the IGF on the Olympics, for the R&A and other leading golf organisations; to in-depth investigation into what the value of BRANDS mean to consumers; new audience and consumer segmentation work for manufacturers and events including The Open; and, as Brendon mentioned earlier, an incredibly interesting exploration into what children and parents believe make the perfect golf club for juniors. We have also expanded our services and invested in a new geo-engagement tech start-up – SPORTS ON-POINT – to deliver proximity triggered communication and research to fans and customers based on their location – think Minority Report for the sports industry! So as you can see, life at SMS INC. is certainly not dull at the moment and may I take this opportunity to thank you all for your support and BUSINESS and we look forward to working with you on new and exciting projects over the next 12 months. Thank you, Richard – well, there are 23,072 yards in a half marathon, and so being short by 150 yards means I completed 99.994% of the total distance. In my mind – done! Are you ready for a short run-through of numbers in sport? This is a shortened version of the speech – but a full transcript is available with all numbers for those who contact me! There will be a lot of numbers – so I hope someone is counting……..…. So, here we are back at THE OPEN – this time the 146th OPEN CHAMPIONSHIP, which has lots to live up to after the amazing “Duel of The “SONS” – Stenson and Mickelson – last year at Royal Troon. An epic match play scenario that had the spectators and the TV audiences hooked ended with a joint-record last round at THE OPEN of 8 under par by Henrik with him birdieing four out of five or his last holes, and also establishing an OPEN CHAMPIONSHIP record of 20 under par. His final round 63 also equals the lowest final round score to win any Major ever. We have since had further European Major success in male golf with Sergio’s victory at The Masters in his 74th Major Championship – and this all happening on what would have been Seve’s 60th birthday. So, has this success been translated into golfing growth and strong golfing performance in Great Britain? 2017 has started well. An early look at Rounds Played as at the end of June 2017 for the half year is showing growth of 7.1% – with the lead region being the south up 12.7% – the good weather has got people golfing – and this is the second best half-year average over the last 5 years. However, we have seen the total golfing numbers continue to fall, in 2016 dropping to below 3 Million which is down from a high of 4.1M golfers in 2007. As I like numbers, I asked HowDidiDo to have a look at qualifying competitions and rounds played during the first half of 2017, and these are up 8.9% and 10.3% respectively. What was also interesting, is that with the better weather, and the more rounds played, there has also been a 12% increase in Holes-in-One achieved in competition – almost 1,375 – and scores improved against the Standard Scratch Score by almost 1.3 shots or 17% better. Good weather not only leads to more rounds – it leads to better golf, and better golf leads to more FUN! At Royal Troon, we congratulated Antony Scanlon and Peter Dawson as we looked forward to the ‘momentous’ return of Golf to the Olympics after 112 years in exile. Perhaps the most important golfing medal was the bronze won by Shanshan Feng of China in the ladies event. Since, Rio, Shanshan Feng has been granted a personal audience with President Xi Jinping – and the Chinese Olympic Committee has subsequently announced that golf will be one of their eight key focus sports for future Olympics. Whilst Chinese surnames promise to make future speeches immeasurably harder………..a commitment to golf by the world’s most populous country can only be good for the game. Before we leave golf, the 146th OPEN Championship will see our annual equipment census of all players. This includes the identification of all equipment used by the players from their shoes, shirt and their cap, to obviously their driver, fairways, hybrids, irons, wedges and putters. Since 1995, and after last week’s AAM Scottish Open, we will have attended 921 events on the European Tour or at THE OPEN. We will have been through almost 129,150 golf bags, and hence identifying almost 1.8 million clubs. John Whyte – who manages our team running the equipment census – although sadly is not in attendance for this lunch as he is out validating bags as we speak – has been doing the European Tour census since the 5th of July 2006 – or for 4,028 days. He has attended 418 events, has taken 917 flights – so has flown every 4.4 days and has completed 1,514,004 miles which is the equivalent of flying 61 times around the world, or just over 3 times to the moon and back. That is some commitment to the cause! Thank you, John and Team. As we leave golf, one final fact for Birkdale – and for your dinner table sports facts – the 1965 Open Championship here was the only Open between 1963 and 1980 – or 18 Open’s – where Jack Nicklaus finished outside the top six. He came 12th. So, let’s look at other sports – and accomplishments – since we last gathered at THE OPEN. It has beena momentous year – one of those “where were you moments” was the heroics of Maddie Hinch in the gold medal success of Team GB’s women’s Olympic Hockey team. It was certainly a pleasant surprise to see GB winning a penalty shoot-out. The 2016 Olympics was the most successful for TEAM GB ever – finishing second in the medal table ahead of China and with 35% or 130 of the 366 athletes going to the games coming back with a medal, including 100% of the 15 strong track-cycling team. Of the 25 sports that Team GB competed in – medals were achieved in 19 of them, a strike rate of 75%. – and Team GB finished with at least one gold in 15 sports. For those who love their Rugby and the romanticism of the British and Irish Lions, then the recent tour to New Zealand is special. A drawn test series also keeps the relevance of The Lions alive and roaring. What you may not know is that the total number of minutes that the Lions held the lead over the All Blacks in the three Test Series on this Tour was only 3 minutes – but luckily, it was a very important 3 minutes at the end of the second Test. Makovina Wanangarua I Whanga Nui-Atara Vunipola, aka Mako. 6 names and 42 characters……..I prefer Mako. What an amazing tennis year. It has been the year of Andy Murray as World Number 1 – but perhaps a significant change has been the return to the old order. We saw this at the Australian Open with Roger Federer’s victory in the final for the Australian Open against Rafa Nadal, and also the all Williams final in the Ladies events – Serena won this battle of the sisters and the Australian Open for the 7th time, and to set an Open Era record 23rd Grand Slam victories – and she did this whilst 6 or 7 weeks pregnant! Then we were enthralled by Rafa Nadal’s victory at Roland Garros in June 2017 for his 10th victory in The French Open – in his 7 matches he did not lose a single set, and only lost 34 games – the second best Grand Slam performance in history. We then had the Wimbledon Finals – Venus at 37 and holding 7 Grand Slams against Garbine Murguruza on Saturday, and then I am certain that some of you were listening to Roger Federer winning in his 11th Wimbledon Final against Marin Cilic whilst heading up to Birkdale – there are too many firsts but it was his 19th Major and 8th Wimbledon Title – a record in the Open era – and like Rafa In Paris he also did not lose a set for the whole Championships. For SPORTS MARKETING SURVEYS INC., Wimbledon was our 33rd consecutive year of the full equipment census identifying the racquets, shoes, apparel and equipment of 610 players. Wilson was the #1. Racquet at The Championships (overtaking Babolat who were co leaders and then leaders in 2015 and 2016 respectively). Nike led the shoe count – and there was a strong showing for asics in shoes, and Babolat, Head and Yonex in racquets – with the latter showing the greatest increase in racquets in play up 17 racquets on last year. A new brand appearing in tennis shoes was Mizuno – who had 57 players on the SW19 grass. One fact that puts tennis in perspective. Local Premier League club Everton has just spent £50M on Jordan Pickford and Michael Keane – with the same money, you could purchase all of the Tennis balls shipped in Europe in 2016. For many years, we have heard that golf has been losing out to cycling, as golfers move to lycra and road bikes. Well, the cycling market is not having it all its own way. Cycling has no reliable industry figures, but anecdotally sales in units are down, we are seeing IBD (Independent Bike Dealers) closing; industry consolidation – Wiggle has purchased Chain Reaction Cycles – the two leading online retailers. The industry is concerned. Cycling does not have the same level of insight and research that is available in golf. We are trying to change this – however, as the golf industry, we cannot use the excuse that it is the growth of cycling that is creating issues for golf. THE FINAL HOLE – 473 yards par 4. Let’s Finish. An old theme. Golf is not broken – there are so many positive news and stories and things to focus on: FEMALE GOLF, FAMILY GOLF, FAST GOLF, FLEXIBLE GOLF,– and the FUN of GOLF; and as the industry, we need to go out and talk up the sport, the benefits, the heroes. Talking of heroes and stars of the sport, I am going to leave the last words to one golfer who has passed on since we last gathered at Royal Troon. On the 25th September 2016, shortly after his 87th birthday, we lost Arnold Daniel Palmer – the OPEN Champion winner here in 1961 and famous for the 6 iron on the 15th, so I would like to leave the last words to him. John Bushell – Managing Director at SMS Inc.